Our main product focus is 3G and 4G routers and antennas for remote monitoring and management, for example to enable remote access to a CCTV installation using a 4G SIM card. In fact, wherever you need an Internet connection using the convenience of 3G and 4G mobile broadband technology instead of using traditional fixed landline Internet services then a 4G router with fixed IP SIM card will provide a convenient, fast and easy to deploy Internet service for any remote monitopring and management or machine to machine M2M application. The Proroute H685 3G is a premium grade, industrial M2M 3G router using the latest HSPA+ technology to deliver reliable, high speed 3G mobile data connectivity for M2M applications such as CCTV and Digital Signage. The Proroute H685 3G Router can be used for any application where a quick, convenient and low cost solution is required to provide remote connectivity for monitoring or management where traditional fixed line broadband is unavailable or time or cost contraints require an alternative solution. Using the new HSPA+ networks in the UK, the Proroute 3G Router is able to deliver a reliable mobile broadband service and when used in conjunction with one of our Fixed IP SIM cards provides an easy configurable and managed 3G router solution. The sturdy metal casing, wide ranging voltage and temperature operating tolerances as well as tried and tested hardware, CPU and 3G module deliver outstanding performance compared to other 3G routers in this class. The H685 3G Router inlcudes advanced keep alive features to ensure that the 3G connection stays live and inlcudes failsafe SMS and Voice reboot and status functionality as well as advanced IP routing features such as BGP. High speed wireless (N Wireless as well as 802.11 b/g), as well as a single wired LAN port provide convenient LAN connectivity and the router also includes a WAN port so it can be used in failover mode. Some customers even use a second H685 router to provide a dual 3G failover solution between the two routers. The Proroute H820 3G Router is the big brother to the popular H685 3G Router and offer all the same features and reliability but with additional LAN ports. The Proroute H820 3G Router offers high speed HSPA+ mobile broadband connectivity with download speeds up to 21Mbps and upload speeds up to 5.76Mbps and as an M2M 3G router it includes 3G keep alive features as well as extra resilience with SMS Reboot and SMS status and alarms. The H820 3G Router provides 4 x 10/100 LAN Ethernet ports as well as built-in N Wireless WiFi connectivity and a WAN Ethernet port in the event that you want to use the proroute as a failover 3G router for your wired internet services. The Proroute H685 M2M / IoT 4G Router is a premium grade, industrial M2M router using the latest 4G LTE network technology to deliver reliable, high speed 4G mobile data connectivity for M2M/IoT applications such as CCTV and Digital Signage and multitudes of remote management and monitoring applications. Built on the success of the Proroute H685 3G Router with a new 4G LTE module which is backwards compatible with existing 3G HSPA and HSPA+ networks, this 4G LTE router can be used for any application where a quick, convenient and low cost solution is required to provide remote connectivity for monitoring or management where traditional fixed line broadband is unavailable or time or cost contraints require an alternative solution. Using the 4G mobile phone networks in the UK, the Proroute 4G Router is able to deliver a reliable mobile broadband service to provide an easily configurable and managed 4G router solution. The sturdy metal casing, wide ranging voltage and temperature operating tolerances as well as tried and tested hardware, CPU and 4G LTE module deliver outstanding performance compared to other 4G routers in this class. The H685 4G LTE Router inlcudes advanced keep alive features to ensure that the 4G or 3G connection stays live and inlcudes failsafe SMS and Voice reboot and status functionality as well as advanced IP routing features such as BGP. High speed wireless (N Wireless as well as 802.11 b/g), as well as a single wired LAN port provide convenient LAN connectivity and the router also includes a WAN port so it can be used in failover mode. You could even use a second H685 4G router to provide a dual 4G failover solution between the two routers. The Proroute H820 4G Router is the big brother to the H685 4G Router. The H820 uses an embedded 4G LTE module offering high speed 4G mobile data connectivity with download speeds up to 100Mbps and upload speeds up to 50Mbps. The Proroute H820 4G router is also backwards compatible with 3G networks so can offer high speed 3G connectivity with DC-HSPA+ (42Mbps), HSPA+ (21Mbps) as well as HSPA, UMTS and 2G EDGE/GPRS connectivity. The Proroute H820 4G LTE router provides 4 x 10/100 Ethernet LAN ports, 1 x 10/100 Ethernet WAN port, 802.11b/g/n WiFi and inlcudes all the normal router features inlcuding firewall, VPN and 3G/4G network keep alive features. Proroute H900 is the new dual SIM 4G router with 4 x Ethernet Ports (2 x GB and 2 x FE), choice of WiFi configuration, RS232 and digital IO ports. It is available in two versions, H900 CAT6 version features an embedded CAT6 LTE 4G Modem (300Mbps Download) and also Dual Band WiFi (2.4 Ghz & 5.0 Ghz) and thn there is the H900 CAT4 version that has an embedded CAT$ 4G Modem (100Mbs Download) and single band (2.4 Ghz) WiFi. Both Versions (H900 CAT6 and H900 CAT4) come with dual SIM card slots for failoover to backup network SIM to provided enhanced option for 4G network connection resilience. The H900 4G router is housed in a robust metal casing and can be DIN Rail mounted or wall mounted. Proroute H700TT is the new high speed 4G Router that includes dual CAT6 LTE 4G modems for two simultaneous 4G connections that can be used in hot swap failover mode for the ultimate in 4G mobile broadband reliability or can provide load balancing for the devices on the LAN. Speaking of LAN connectivity, the H700TT router does not disappoint there either, with 4 x Gigabit Ethernet Ports and dual WiFi (24.Ghz and 5.0Ghz) 802.11AC high speed WiFi as well as a high speed processor to ensure everything works together to provide the optimum performance. IDG761 is a robust and reliable embedded 4G router with 4 x Ethernet Ports and 802.11n WiFi. It has Dual SIM failover as well as dual power input for failover and all the normal software network connectivity resilience options like ping reboot, daily reboot and SMS reboot. The Amit IDG761-0T001 will provide all the funactionality you require for a variety of M2M remote access and monitoring applications such as CCTV, Point Of Sale, Building Management or energy and environmental management and monitoring. Amit IDG500 is a compact 4G router providing Ethernet and WiFi connectivity for LAN devices with embedded 4G modem with SIM card slot to provide reliable, high speed LTE 4G mobile broadband connection for M2M applications. CradlePoint COR IBR600 4G Router with WiFi is an affordable and feature rich managed 4G wireless broadband router, designed and built for M2M networks, perfect for critical business and enterprise applications requiring 24 x 7 connectivity. Considering the IBR600 compact size, sleek metal case, mounting bracket and external mobile broadband and WiFi antennas, it is easy to understand why this compact M2M 4G router is ideal for high-availability industry applications including Retail, Finance, Security, Transport and Construction. The new Teltonika RUT950 LTE M2M 4G Router will be available in march 2015 and provides an excellent low cost M2M 4G Router solution for a variety of remote monitoring and management applications. 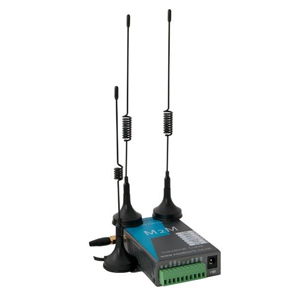 We supply Cellular Antennas for use with our 3G and 4G Routers. In most cases these antennas are supplied with an SMA Male connector becuase the majority of our 3G and 4G Routers have this type of connection. Our range of 3G antennas is being replaced by the new 4G antennas which in many cases are wideband 4G antennas which means that they cover the 2G, 3G and 4G spectrum (800-2600mhz) so can be used as GSM Antennas, 3G antennas and 4G antennas so if you cant find what you want in the 3G antenna section then look in the 4G antenna section for a wideband / full band antenna which covers the 3G frequencies. SORRY - We do not provide antennas for use with dongles and we do not provide and adapters to convert to CRC9 or TS9 so we will be unable to assist with any enquiry for USB Modems with these antenna connection types. When you need a simple solution for remote access to your 3G or 4G router our fixed IP SIM cards provide an effective way to ensure a wireless broadband service with the convenience of a fixed IP address. This means that when using either a 3G Fixed IP SIM card or a 4G Fixed IP SIM card in a 3G router or 4G router you can connect to the router from anywhere and using port forwarding can easily connect to the devices on the LAN. THIS IS THE LATEST VERSION OF THE D2377 4G SIGNAL TESTER AND IS SUPPLIED WITH USB INTERFACE / CHARGING CABLE. As many 3G Routers are required for mobile or temporary offices we will soon be making available a range of products to compliment the 3G Routers that will provide business telephony using a combination or choice of GSM and VoIP Technologies. Do you need 4G Mobile Broadband Connectivity for your vehicle? Connect to your DVR and remotely monitor sites using a 3G / 4G router to offer wireless broadband connection. Then why not choose one of our 4G Routers to share your new super fast 4G wireless broadband Internet service. View our range of high speed 4G routers. Teltonika are a leading European manufacturer of 3G and 4G Routers for M2M remote monitoring and management applications. Accessories and spare parts for our range of routers and antennas inlcuding power supplies, POE Power supplies, antenna connectors, DIN Rail Mounting Kits and accessories for our GSM Gateways. Please see below for links to manuals, FAQ and product firmware updates. Proroute have quickly established themselves in the UK as market leaders in the M2M marketplace as manufacturers of reliable and practical 3G and 4G Routers. Offering exceptional value for money, the Proroute brand has become a leader in providing wireless broadband solutions for remote management and monitoring for CCTV, Digital Signage and solar/wind enery installations. View the range of Proroute 3G and 4G Routers designed for M2M remote management and monitoring applications. View the Amit range of industrial grade M2M 4G routers, ranging from the entry level, compact IDG500 through to the VHG760 and IDG761 Dual SIM 4G Router. All the Amit routers provide great value and features as well as providing a reliable 4G mobile broadband solution and some of the Amit routers provide exceptional value, especially the IDG500 dual SIM router with embedded 4G modem which is available from under £90.00. Here are our recommendations for 4G routers for office use. Many of our solutions are aimed at the M2M and business marketplace and in many cases are unsuitable for the home / small office user. We have listed below some of the 4G routers that we have approved for the home or office user becuase of their easy installation and functionality. 3G and 4G Routers and Fixed IP SIM cards provide a convenient, rapid deployemnt solution for remote access and monitoring.